The internet offers a fine façade. With computer programs, stock photos, air brushing, and editing anyone—and everyone—can have a professional profile; a clean website, an image of their choosing. I am striving for that too. I have spent innumerable hours researching other people’s websites, looking to see what I like, what I don’t like, how I perceive this or that person through their virtual presence. Very rarely is there an unprofessional or chaotic website. Internet tools are far too advanced now; anyone can create a professional presence. If there is a problem in this, it is that people present themselves too professionally– some websites seem (to me) to be too glossy, too overdone, too much like the person is trying too hard to sell themselves. As a scholar, an educator, and leadership mentor, I certainly want to project a virtual image that is intelligent, confident, and trustworthy. 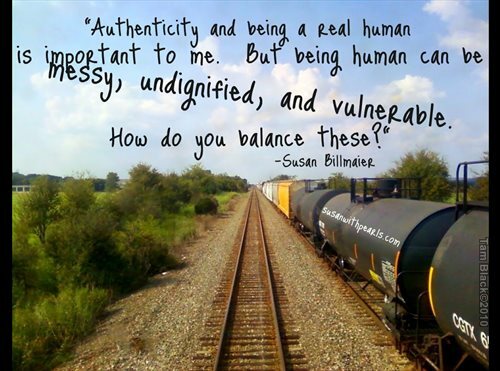 But authenticity and being a real human is important to me too, and being human can be messy, undignified, and vulnerable. How do I balance these so it comes to you, my friend, as a unified package? As “this is who I am” –all of it: messy, stumbling, faltering, questioning, rising, shining, and brilliant all rolled up into one little package? I once read a story written by the friend of a woman with cancer. The friend watched as the woman with cancer went through bouts of doubt, depression, anxiety, courage, optimism, and power. She described her friend as simultaneously the most vulnerable and the strongest person she has ever known. This is the paradox of humanity: people are everything all at the same time and the opposites within us must find peace and balance. It seems to me the people who I want to follow, the people who I trust, the people who I learn from are the people who experience obstacles, challenges, and doubt and learn to get through it. Those people are climbing, reaching back with a helping hand over this or that block, telling me where there are holes or branches in the way. They may just be a few steps ahead of me but they just stepped in the hole or got hit in the face with the branch; they can tell me about it and make my journey that much easier. Here I am…human, stumbling, falling, reaching back, and telling you about it…hoping to make your journey easier. In our vulnerability lies our strength. Perhaps we never quite find our real strength if we do not allow ourselves to be vulnerable. If you prefer the glossy side, visit my purely professional website http://susanbillmaier.com/ .